You are more likely to encounter someone — friend, family member, coworker, neighbor, or member of the community — in an emotional or mental crisis than someone having a heart attack. 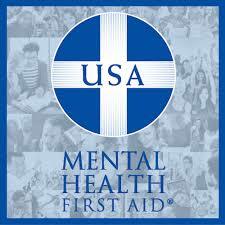 Mental Health First Aid teaches a 5-step action plan to offer initial help to people with the signs and symptoms of a mental illness or in a crisis,and connect them with the appropriate professional, peer, social, or self help care. Anyone can take the 8-hour Mental Health First Aid course — first responders, students, teachers, leaders of faith communities, human resources professionals, and caring citizens.